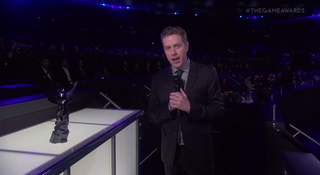 Ever wanted to know just how Geoff Keighley put together The Game Awards? Or what he does all day when he's not tweeting about giraffes? Today we've got longtime video game journalist Geoff Keighley, who is best known for his work producing and hosting The Game Awards, a spiritual successor to what was once the VGAs on Spike TV. Keighley, a friend of Kotaku, has also written a series of studio deep-dives called The Final Hours, in which he chronicles the weeks, days, and hours leading up to various games' final releases. Earlier this week, Keighley also launched a new podcast—you can find the debut episode, with Valve's Gabe Newell and Erik Johnson, right here. Keighley will be here for an hour or two taking your questions. Ask him anything you'd like. UPDATE (6:11pm): And we're done. Special thanks to Keighley for taking the time to chat with us today.